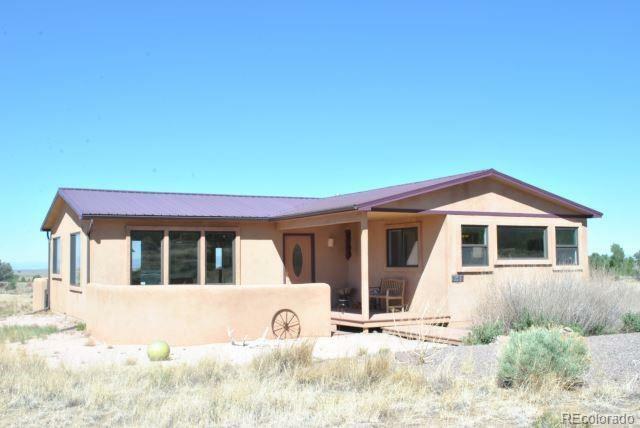 Fantastic views of Sangre de Cristos, the San Juan range, valley views, and the sand dunes with magnificent sunrises and sunsets. This one level 3 bedroom 2 bath home is open with lots of natural light. Kitchen features lovely granite tile counters, custom hickory cabinets, pantry, lots of eat-in counter space. Wood floors, and artsy lighting give this home a great energy. Master bedroom has a view of the mountain range that is stunning, with attached large master bath. Guest bath sits off the living room, but secluded by a small hall which leads to two other bedrooms. Utility area leads out to carport. Convenient to entrance as a mud room also. Front and back patio areas to enjoy views from both sides. The 2.98 acres makes this property secluded and quiet, with no close neighbors. Very well built and energy efficient home with ETS heater and on/off peak electric metering. Storage shed by carport.